Mary Lou (Sprouse) Coffman, 89, loving mother, grandmother and wife of John Logan Coffman, Jr., of 1943 Little River Road, Goshen, went to be with her Lord and Savior on Wednesday, November 28, 2018 surrounded by her family at her residence. Mrs. Coffman was born on June 25, 1929 in Augusta County, a daughter of the late Jesse Summerfield and Mollie (Sprouse) Sprouse. Mary Lou attended Estaline Valley Church of the Nazarene, she was retired from Genesco-L-Grief Company, and for twenty-three years she taught Weekday Religious Education. She was a wonderful homemaker, she enjoyed baking, attending yard sales, shopping at the Goodwill, and bird watching. In addition to her parents, Mrs. Coffman was preceded in death by a granddaughter, Evanne Coffman; four brothers, Ernest Sprouse, Russell Sprouse, Marvin Sprouse, and Roy Sprouse; and two sisters, Jane Campbell and Thelma Cash. 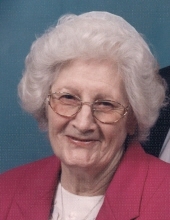 In addition to her husband of 68 years, Mrs. Coffman is survived by two sons, John Logan “Johnny” Coffman, III and his wife Charlotte of Goshen, Jesse Andrew “Andy” Coffman and his wife Annette of Verona; a daughter, Karen (Coffman) Hinkle and her husband Robert “Weatie” of Craigsville; five grandchildren, Angela Canterbury and her husband Jerry, Crystal Coffman, Angel Coffman, Jarrod Coffman and Jordan Coffman and his wife Katelyn; six great grandchildren, Kayla Hinkle, Leanna Canterbury, Delanie Burns, Aidan Coffman, Hannah Coffman and Cole Coffman; a great-great grandson, Abel Deaver; a brother, Jess Sprouse of Craigsville; two sisters, Betty Henninger of Stuarts Draft, and Phyllis Arey of Bridgewater; and number of nieces and nephews. The family will receive friends from 6:00 p.m. to 8:00 pm, Saturday, December 1, 2018 in the Coffman Funeral Home and Crematory and the residence at other times. A Celebration of life will be conducted 3:00 p.m. Sunday, December 2, 2018 in Estaline Valley Church of the Nazarene, 2117 Troxel Gap Road, Craigsville, VA 24430 by Pastor Billy Curry and Pastor Frank Tusing. Burial will follow in the Little River Church of the Brethren Cemetery. Active pallbearers will be Jarrod Coffman, Jordan Coffman, Jerry Canterbury, Rusty Sprouse, Eddie Parker, and Dale Michael. The family would like to extend a special “Thank You” to the Augusta Health Hospice of the Shenandoah for the loving care given to their mother. To send flowers or a remembrance gift to the family of Mary Lou (Sprouse) Coffman, please visit our Tribute Store. "Email Address" would like to share the life celebration of Mary Lou (Sprouse) Coffman. Click on the "link" to go to share a favorite memory or leave a condolence message for the family.